This year’s curbside yard waste collection program will begin the week of April 18 for homes in yard waste collection area “A”, and the week of April 25 for homes in yard waste collection area “B”. Yard waste collection areas can be found at winnipeg.ca/collectioncalendar. In addition, residents can drop off yard waste for free any time at the new Brady 4R Winnipeg Depot, located at 1901 Brady Road. For more information and operating hours, please visit Yard Waste Drop-off. Yard waste in plastic bags will not be accepted because the plastic bags do not decompose and will ruin the finished compost. Yard waste includes unlimited amounts of outside organic materials, such as grass clippings, leaves, plants, flowers, bush/shrub clippings, and small tied bundles of branches no longer than one metre or heavier than 22 kilograms. Some of the materials not accepted in the curbside yard waste collection program include logs, stumps, rocks, dirt, sod, and litter, as these items slow down the composting process and can damage the composting equipment. Residents are urged not to rake any yard waste material or debris onto the street as this can plug the street drains and cause ponding problems as well as increase the risk of basement flooding. Residents are also reminded to place their yard waste containers at least an arm’s length away from their recycling and garbage carts. In 2015, more than 26,000 tonnes of yard waste was collected through the curbside yard waste collection program and composted at the Brady Road Resource Management Facility. The yard waste collection program will help reach our community’s goal of keeping more than half of our garbage out of the landfill. It also helps protect our environment by reusing valuable organic material and significantly reducing harmful leachate and greenhouse gases. 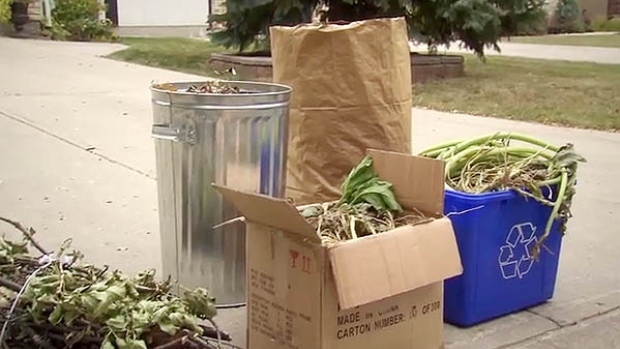 More information on the curbside yard waste collection program is available at winnipeg.ca/yardwaste.